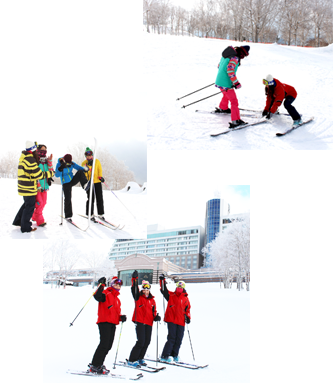 Welcome to Hokkaido, land of great skiers and ski instructors! Many of us just can’t wait for the season to begin, and we’re looking forward to sharing with you all the fun of this winter sport. For hassle free arrangement of private ski lessons, just contact us and let your mountain adventures begin! Just contact Links Innovation, and we’ll help you arrange a ski instructor for you at your requested location within Hokkaido. Depending on your ski level and experience, the instructor will customize the lesson for you. Please inform us of the following. Lessons are available from 1 hour to 4 hours. The general price is 10,000 JPY per participant per hour and 3,000 JPY per additional half hour. *Lift tickets are not included in the prices above. *An additional fee applies for the instructor’s lift tickets. *Additional transportation fees may apply if the ski area is located beyond Sapporo and select areas in the vicinity. *For groups of 2 or more, the lesson will center around the participant with the lowest ski level. *1 instructor will be arranged per group; however, if ski levels within a large group varies, we suggest arranging additional instructors. Please consult. Copyright © 2016 linksinnovation All right reserved.